These may not look like much on my dingy baking pan, but darkness was falling and we were hungry, so snapping a few quick pictures before running inside to eat was all I had the chance to do. You're going to have to trust me on this one, because Food and Wine nailed it with this combination of ingredients! I used gouda (the original recipe called for fontina), but took the rest of the toppings straight from Food & Wine--chopped almonds, prosciutto, and white beans mashed with roasted red pepper flakes and rosemary. You would think your tastebuds would be overwhelmed by the contrast of sweet, spicy, and salty, on top of the varying textures, but together it's one big home run! 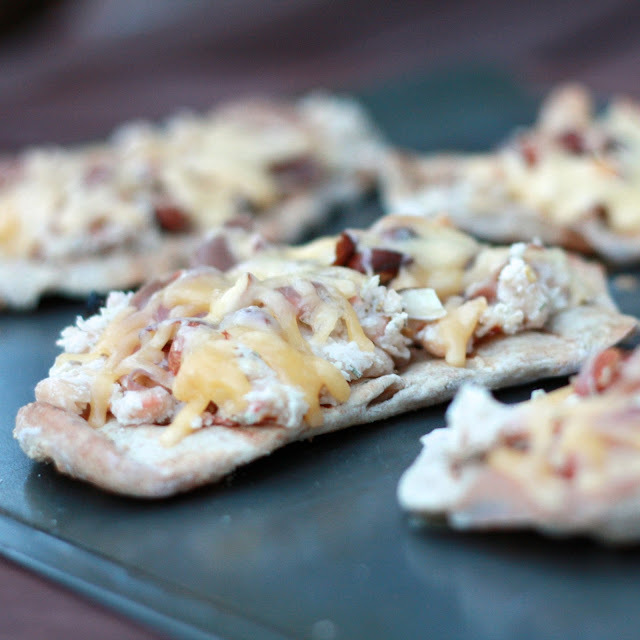 Instead of using pita bread like the magazine suggested, we made our favorite flatbreads on the grill and used those as the base, which I loved. I think pita bread would have been a little softer; our flatbreads were crunchy from being grilled and then broiled, which made it like a very thin, cracker-crust pizza. 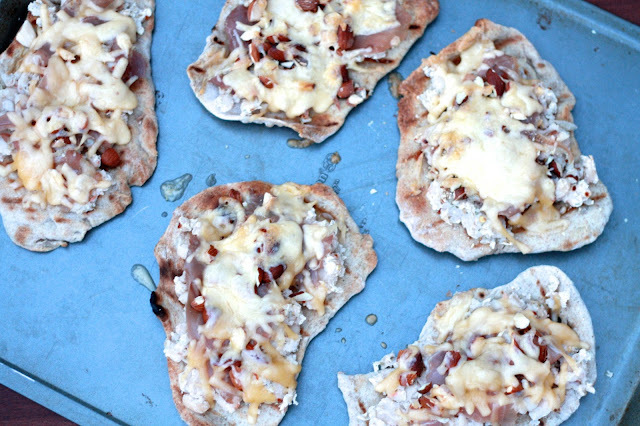 These are fun little personal sized "pizzas", but you could also make them on mini pita breads or cut into smaller pieces and serve as an appetizer. 1. Preheat a large skillet and the broiler. Brush pitas on both sides with olive oil and cook in the skillet over high heat until browned, about 3 minutes. 2. In a bowl, mash beans with the red pepper and rosemary. Spread mashed beans on the pitas. Top with the almonds, cheese, and prosciutto. 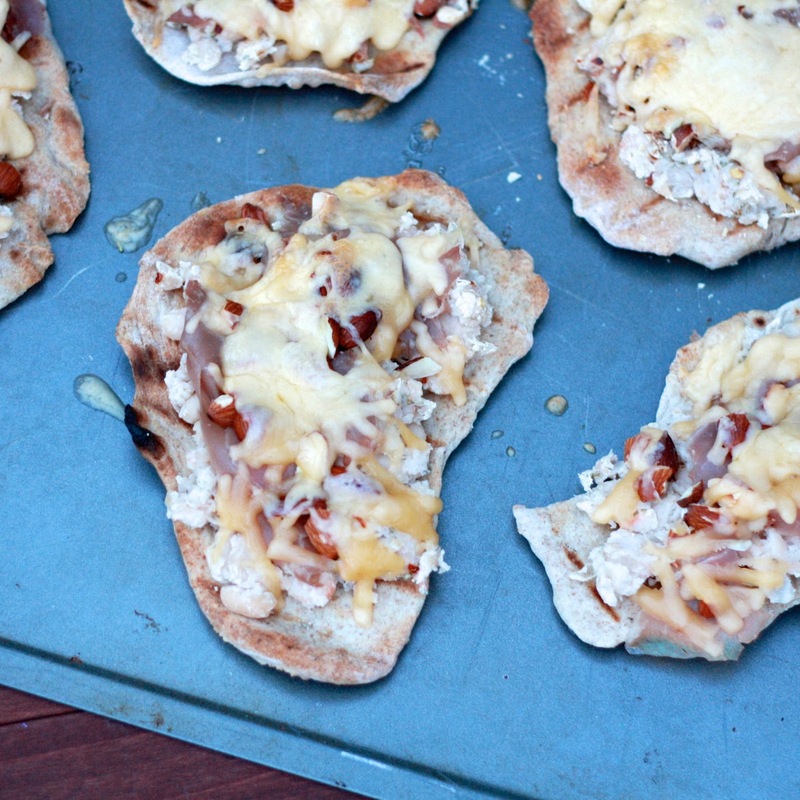 Place pita breads on a baking sheet and broil for 2-3 minutes until cheese is melted.